Following a serious or deadly swimming pool accident, there is only ONE drowning lawyer to trust your case to. Learn more about what sets attorney Jesse E. Guerra, Jr. apart. Attorney Jesse E. Guerra, Jr. is an Aquatic Litigation Pioneer and has successfully litigated many cases involving diving boards and serious injuries. Get the experienced legal help you need and deserve following a swimming pool incident or drowning at a hotel, resort or motel. 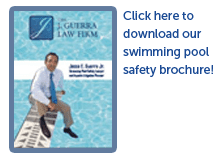 Attorney Jesse E. Guerra, Jr. is a pioneer in the courtroom at litigating cases involving serious or deadly swimming pools accidents and drownings. Pool & Drowning Accident Attorney in Dallas, Houston, San Antonio, Corpus Christi, and More! There are few accidents that are more terrible and deadly than those involving water. Drowning accidents occur in private pools, hotels, motels, parks, water parks, and other locations when supervisors fail in their duties, or when faulty gates, drains, or other hazards endanger a swimmer or a child who has entered an area that should have been restricted. When the victim does survive, their lives are often changed forever, as underwater accidents frequently result in brain damage due to the lack of oxygen suffered in the incident. Many of these accidents are the result of negligence and, when this is the case, it is necessary to seek a Texas drowning accident lawyer to address your claim or lawsuit. Seeking compensation after a tragic drowning accident or pool accident requires the skill of a lawyer who has specialized knowledge in this area of personal injury law. Rather than working with just any attorney who handles injury cases, why not turn to a lawyer who has obtained recognition as a pool safety and water safety expert? This is exactly what you find when you turn to The J. Guerra Law Firm to represent you after an accident. Attorney Jesse E. Guerra Jr. has spent his career protecting the rights of the injured and their families, helping them receive compensation after drowning and other types of injury accidents. In addition to his private practice, he also serves as legal counsel for the National Drowning Prevention Association, where he fights to raise the bar for pool safety throughout the country. Due to his in-depth knowledge on the topic of water safety, the lawyer has even been chosen to assist the Consumer Product Safety Commission with the creation of programs for drowning prevention. Jesse is THE swimming pool attorney to turn to when you need to file a claim for a drowning or pool accident caused by someone else's negligence. We can help you fight for compensation. After your drowning or pool accident occurs, you will need to file a claim or lawsuits against the party whose negligence caused your accident. This will give you the chance to receive the financial compensation that you and your loved ones are rightfully due. Our firm can help you take action against the individual or entity that did not uphold their duty, whether that duty was in maintenance, supervision or another area. Sadly, a high percentage of these heartbreaking cases involve young children, and parents and families suffer unimaginable grief when they have lost loved ones or when their children suffer from permanent injuries. We can assist the families or the injured individual in the legal process in all types of drowning cases, including near drowning, pool accidents, beach accidents, child drowning accidents, water park or hotel drowning, apartment pool drowning, and our cases are supported by the Virginia Graeme Baker Act, passed in 2007, increasing the safety requirements for pool owners and operators. Jesse has been at the forefront in the country in aquatic litigation and is recognized as a writer, activist and attorney with regard to all aspects of safety laws involving swimming pools. He can assist with any cases of summer camp drowning, drowning accidents that involve a defective or broken pool gate, swimming pool drain accidents such as entrapment, pool operator negligence, negligent life guards, boating accidents, spa or hot tub accident cases, and more. When the summer begins and the sun comes out, so do many children and families. However, with the dangers that swimming pools present, your neighbor's backyard can easily become a dangerous area. During the hot summer hours, many of us enjoy and take advantage of public and private swimming pools without paying any attention to the obvious dangers a pool can present. Our firm is here to help you recover lost damages after an accident has occurred on another person's property, such as a public pool, in which a breach of duty or a negligent act has occurred. If your child was injured on another individual's property, you may be able to--with the help of a seasoned drowning lawyer and pool safety watchdog--prove that negligence caused the accident. If you have lost a child due to a drowning accident, do not wait another minute longer to call our firm. We have dedicated our careers to helping families just like yours get back on their feet after an accident has traumatically altered their life. We understand that no amount of money will ever bring back your loved one, but we are committed to ensuring that justice is sought and the negligent party is held responsible. To learn more about our firm and how we are ready to help you fight to protect your right to a fair settlement, call our drowning accident lawyer at our office today. Our team represents clients throughout Houston, San Antonio, Corpus Christi, Austin, Fort Worth , El Paso, McAllen and Brownsville. We also represent clients nationwide. Contact a Texas drowning accident lawyer for knowledgeable and committed legal representation in drowning cases and other injury cases involving safety regulation failures.